Some highlights from previous year’s events. 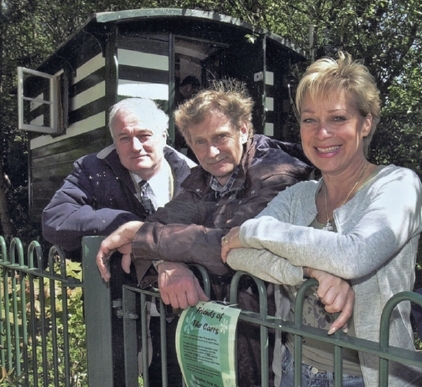 Open Day in the Romany Memorial Garden, May 2005, saw TV favourite, Denise Welch and her young son, meeting the chairman, Les Horton and the secretary, John Thorpe, at the the vardo. Special thanks to all Committee members who gave up their Saturdays to be at the vardo and to Joyce and George Gelleburn, who, whilst no longer members of the Committee, are still to be found on open days with their photo display, jams, marmalades and chutneys. In 2005 they were awarded the Romany Society Member of the Year trophy: a solid bronze statuette of Raq. The team of Park Rangers, led by Brian Hallworth, also deserves a mention, as does Macclesfield Borough Council for its practical support. A comfortable hotel has been provisionally booked. 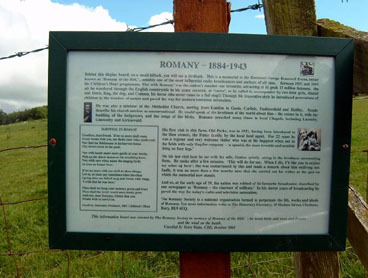 The intention is to visit ‘Romany’ sites in Carlisle and the Devil’s Porridge Museum that displays the life stories of thousands of ammunition workers who Romany administered to in World War I – a very enlightening visit. Google has many appreciative visitors views online. Also, after Romany acquired his Vardo and modified it, in Carlisle, to his liking, he moved it just over the Scottish border to a beautiful spot by the river that we might visit. Those members wishing to stay (or just join the events) should let Derick know. No deposits are needed at this stage. Telephone Derick on 021 973 9784. 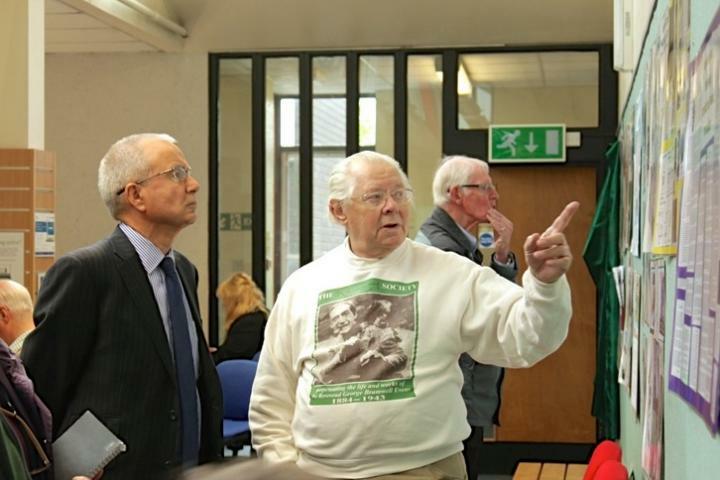 Our AGM for 2014 was held on Saturday 17th May at Wilmslow Public Library (South Drive, SK9 1NW). The speaker was Pennant Roberts, a declared Romany enthusiast, who has contributed his reminiscences to a new book by (Lady) Jenny Melmoth Of Dogs and Cats and Bear in the chapter describing her search for Children’s Hour favourites. A practised speaker, he promises us an enthusiastic and entertaining talk. 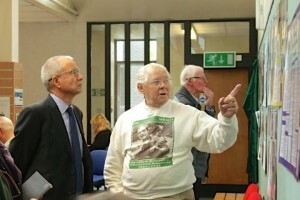 Derick Wood, Romany Society Chairman, put together the exhibition on Romany, Click to enlarge. Full details and and more pictures are on the News page. Following a successful Romany Weekend in the Eden Valley last year, commemorating the 70th anniversary of Romany’s death, we will this year be visiting some sites associated with his later life. The event will be based around Wilmslow. We will visit Romany’s house, where he died, ‘Romany’s Walk’, his Memorial garden, Raq’s Grave and the adjacent library where there will be a Romany of the BBC Exhibition, his books for loan and a large collection of reference books and ephemera. Other sites will include Lindow Common, once a Gipsy camping area and horse trading location. Now a SSSI with rare lowland bog we will visit and be given a guided tour a knowledgeable local ranger. Romany once rescued a girl form one of the ponds here. If time permits we may also visit the BBC Building in Manchester from where Romany broadcast and the Methodist Mission where his uncle Gipsy Smith used to work. The main event will be a coach trip to Bradford Industrial Museum to see his newly restored vardo in its new home. As usual there will be our Annual Dinner on the Saturday night. The October 2005 members’ weekend was once again held in the Whitby area and was so oversubscribed that for the first time a number of applications had to be rejected. Thanks go to Ray Hollands for organising the event, taking the strain from Phil Shelley. Phil has done a tremendous job over the years, for which we thank him. We have also to thank the Winterschladen family, in particular Jonathan and Viv, who allowed us to look around Romany Cottage, and George and Mary Swalwell who again entertained the entire group to lunch on the Sunday. The 2004 Members Weekend was in Cumbria. It included the opening of the Kirkoswald School Wildlife Garden with Terry Waite plus a Romany Walk and a service at Romany’s memorial. This was a special year – the 60th anniversary of Romany’s death in November 1943. Our October weekend included special events to mark the anniversary, and there was a special Thanksgiving Service on 20th November. We began with a visit to Glassonby Methodist Chapel with the Reverend Alan Gawthorpe. Member Arthur Kidd described his own experiences of hearing Romany preach at the Chapel. Outside Terry Waite unveiled a bronze memorial plaque commemorating Romany’s many visits to the Chapel. Members then drove to Old Parks Farm to see the information board and to walk to the memorial birdbath, where Terry Waite, Phil Shelley and Joyce Gelleburn spoke. After lunch it was on to Kirkoswald Primary School for a spot of tree planting, with teachers, pupils and press and TV. The School was given the Romany Society grant of £200 to help build a bird hide. The final morning was spent in the company of the congregation at the Methodist Central Hall in Carlisle, founded by Romany in 1923. The weekend concluded with Terry again unveiling a bronze plaque, this time commemorating Romany’s time at the Carlisle church. 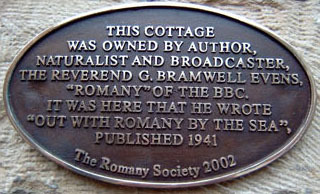 Wilmslow, the location of the Thanksgiving Service, was where Romany spent the last four years of his life. The ‘Service of Thanksgiving for the Life and Works of the Reverend George Bramwell Evens, Romany of the BBC’ was held at the Wilmslow Methodist Church in Water Lane. 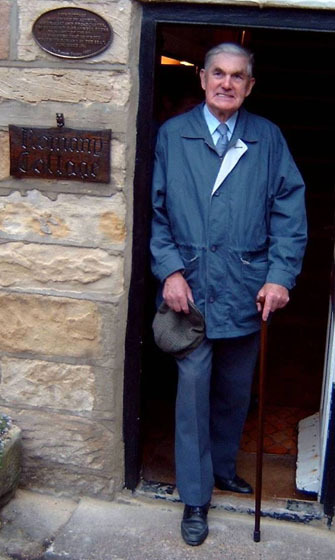 The event was a celebration of Romany’s life, with his music (‘Lullaby of the Leaves’ and ‘Smilin’ Through’) and with reminiscences from Terry Waite, a lifelong fan of Romany and the Reverend Father Ray Hollands, who was inspired to join the Ministry because of his interest in Romany. Roly Bain, the well-known clown-minister, who is one of Romany’s grandchildren, made a very personal, family-oriented contribution. The evening closed with Phil Shelley’s pictorial tribute, set to ‘On hearing the first cuckoo in spring,’ by Delius. More than 25 members attended the 2002 weekend visit to Whitby. George Swalwell (‘Tim’ in the books) unveiled a plaque at Sandsend commemorating Romany’s time there.